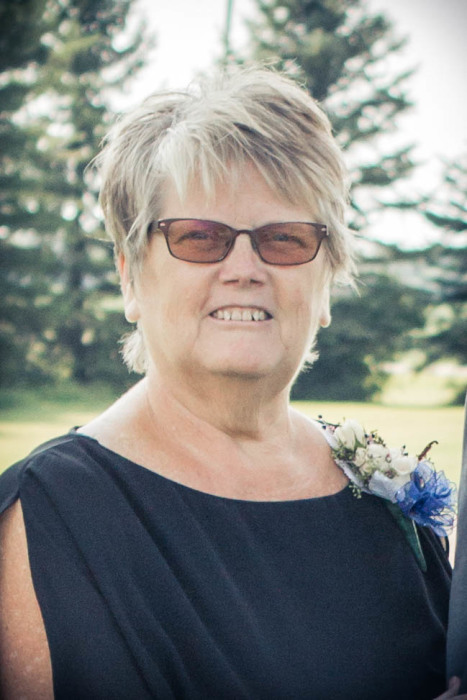 Obituary for Kerry Kelly | Hanson & Dahl Funeral Home, Inc.
Kerry Kelly died Wednesday, March 20, 2019 at her home in rural Dawson, MN at the age of 67. Funeral services will be held on Monday, March 25, 2019 at 10:30 at Lac qui Parle Lutheran Church, rural Dawson. Rev. Bruce Bringle will officiate and interment will be in the church cemetery. Visitation will be held on Sunday, March 24 from 4:00-7:00 PM at Hanson & Dahl Funeral Home in Dawson with a prayer service at 7:00 PM. There will also be visitation at the church for one hour before the services on Monday. Kerry Layne (Erickson) Kelly was born November 23, 1951 in Fergus Falls, MN the daughter of William and Donna Mae (Kofoed) Erickson. She graduated from Dawson High School in 1969. Kerry moved to Minneapolis to work at Dain, Kalman & Quail. She was united in marriage with Dallas Kelly March 16, 1974 at the First Presbyterian Church in Dawson. They lived in town for a short time before moving to the farm north of Dawson where they raised four children: Jason, Jennifer, Jeffrey and Jacque. She worked at Food n’ Fuel Convenience Store and Home Medical before she found her home at the Dawson Co-op Credit Union for 22 years. Kerry enjoyed golfing, playing cards, camping, traveling, reading, quilting and watching various sporting events and activities. For over 40 years, she’s looked forward to the annual gathering of high school friends at the casino/hotel. Since retirement, she has kept busy preparing and delivering meals to the field, trips to the Brookings theatre and going to garage sales with her friends. Her greatest love was spending time with her family but especially her grandkids. She was active at her church and served as the church treasurer. She was also involved with the Blood Mobile, Blackjack Booster Club and helped out during Dawson Riverfest. She is survived by her husband, Dallas; four children: Jason (Stephanie) Kelly of Dawson, Jennifer (John) Stanoch of Waconia, Jeffrey (Tonya) Kelly of Dawson, and Jacque (James) Laney of Owatonna; six grandchildren: Jaedyn, Janielle, Taylen, Dreyton, McCayn, and Tacker; her mother, Donna Bjornlie of Dawson; three sisters: Susan Erickson of Richfield, Barbara (Steve) Bjorndahl of Maynard and Beth (Bob) MacPherson of Rosemount; sister-in-law, Donna Anderson of Madison; and nieces and nephews. Preceding her in death were her father, William Erickson; step-father, Reuben Bjornlie; niece, Brianna Bjorndahl; nephew, Bryan Bjorndahl; in-laws: Lester and Jonetta Kelly; sister and brother-in-law: Joyce & Reuben Muehlbauer.